Striking CCTA bus drivers have maintained a picket line at Church and Cherry streets every day since walking out last week. The Chittenden County Transportation Authority said striking bus drivers submitted a "credible" contract offer last night and expect negotiations to resume soon — the first encouraging sign of progress in an ongoing labor dispute that has stalled public transportation in the region. 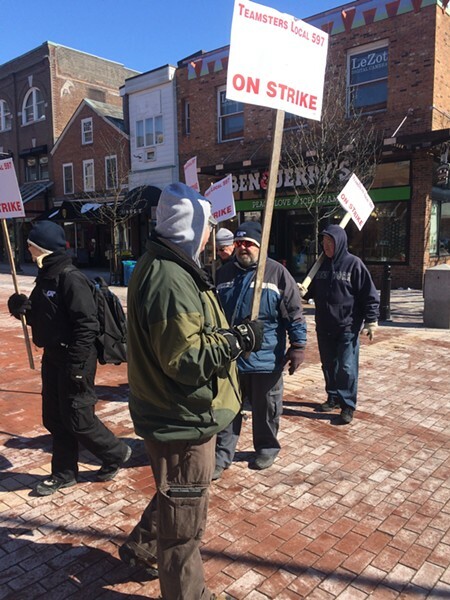 The drivers' offer was delivered at 8:30 p.m. Wednesday, as the Burlington City Council was debating a resolution encouraging parties to come to an agreement, CCTA officials said in a statement. "It is CCTA’s hope that the union’s new compromise proposal will move the discussion forward on the remaining four articles — wages, work rules, security cameras and the use of part-time drivers," the agency said today. "A fair and respectful negotiation that arrives at a compromise on each of the four remaining issues is CCTA’s preferred course for restoring service to the communities we serve. "The union’s most recent proposal represents a productive step toward compromise and we expect negotiations with the assistance of the Federal Mediation and Conciliation Service will be restored very soon," the CCTA statement read. CCTA did not release details of the contract offer, and union representatives could not immediately be reached for comment. Drivers went on strike last Monday, forcing 9,700 daily bus riders, including many lower-income residents, to seek alternate transportation or be stranded. CCTA leaders have hinted that if an agreement is not reached soon, they might begin to consider alternatives, including pursuing action with the Vermont Labor Board or the court system, or hiring temporary replacement drivers. Chapin Spencer, one of Burlington's two representatives on CCTA's board of directors, told city councilors that the board would likely meet next week to consider possible alternative measures. Drivers have overwhelmingly rejected CCTA's previous contract offers. They left a negotiation session last Saturday without an agreement to bring CCTA's most recent offer to a vote.